Sod delivered to your doorstep or available for pick up by the piece or the pallet. EMPIRE Zoysiagrass is as hardy as it is attractive and has a deep, thick root structure. It is more drought tolerant than most varieties of zoysiagrass once established. In addition, slower vertical growth plus natural chinch bug and chemical resistances mean your lawn will require less maintenance, mowing, and water than other types of warm season grass. In some instances, once naturalized to the local climate, EMPIRE Zoysiagrass requires minimal irrigation. Palmetto is a native St. Augustine cultivar selected for better color and finer texture than ordinary St. Augustine. Palmetto St. Augustine demonstrates superior shade, cold, frost, heat, and drought tolerance. This versatile turf grass is used across the southern United States, from the Carolinas to Florida, and under a wide range of climate and soil conditions. This makes it the ideal choice for residential and commercial use. Celebration Bermudagrass is an Australian Breed Cynodon dactylon developed by renowned turf grass breeder Rod Riley that offers specifiers, landscapers, golf course designers, sports turf managers and homeowners exceptional performance across a wide spectrum of applications. Celebration Bermudagrass requires less mowing than typical bermudagrass varieties and has tough runners, rhizomes, and deep roots that provide excellent sod strength, wearability, and improved drought tolerance. While shade tolerance research is ongoing at the university level, Celebration Bermudagrass is the first bermudagrass to exhibit improved tolerance in sports turf comparisons. Celebration Bermudagrass has also been included in several comparative bermudagrass studies including the 2002 National Turfgrass Evaluation Program (NTEP) trials where early observations are very promising. Common Bermudagrass is drought resistant and grows on many soils, it also makes a good turf if fertilized and mowed properly. Common Bermudagrass is used mostly along highways, roadways and a great solution for embankments that need erosion control. Common Bermudagrass is one of the most economical grasses available in the southern region. If fertilized and maintained properly, it can be a quality turf grass used for golf courses, sports fields, parks, residential and commercial lawns. Tifway 419 Bermuda is a hybrid bermudagrass developed specifically for athletic applications such as golf courses, football fields, baseball fields, soccer fields, and other high traffic sporting fields. It is characterized as having a beautiful dark green color with a medium to fine textured leaf. Tifway 419 Bermuda is a vigorous grower that establishes itself extremely quickly adding to the benefits of its applications. Your organization will also benefit from its drought and disease resistant qualities that will help add many years to the life of your turf grass with less maintenance requirements. Read below to get a more detailed look at our certified Tifway 419 Bermuda. Argentine Bahiagrass is a warm season southern grass. This grass is resistant to drought, disease, and most insect attacks and can survive in a variety of soils from sand, sandy to clay, and other infertile dry soils. Argentine Bahiagrass requires some maintenance to keep looking good in residential and commercial landscapes. Without fertilizer, Argentine Bahiagrass will thin out over time. Argentine Bahiagrass also has a low tolerance for many weed control herbicides. It is used extensively in lawns along coastal areas in Florida and has a vigorous growth habit that requires frequent mowing during hot weather. This grass pertains a coarse blade and is not suitable for soils with high pH levels. 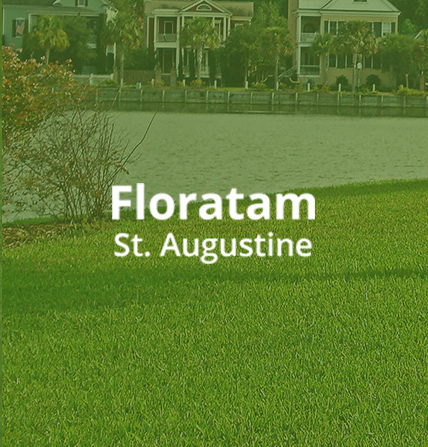 Floratam St. Augustine was released by the Florida and Texas Agricultural Experiment Stations in 1972 as a SAD virus and chinch bug resistant turf selection. It has since been observed to be brown patch tolerant as well. Bitterblue St. Augustine is an improved variety selected in the 1930s. Bitterblue has a finer, denser texture and darker blue-green color than common St. Augustine grasses. It has improved cold tolerance and good shade tolerance, but is not resistant to chinch bugs or gray leaf spot disease. Its tolerance to atrazine is also lower than other varieties, making weed control more difficult. Bitterblue can produce a good lawn under proper management practices and pest control. Seville St. Augustine features a finer texture than common St. Augustine varieties. It is tolerant of both shade and salt and can thrive in a wide range of pH soil ranges. Seville features a good shade tolerance and can thrive on six to seven hours of sunlight per day. Sod delivered to your doorstep or available for pick up by the piece or the pallet. All grasses are on 500 sq. ft. pallets. EMPIRE Zoysiagrass is as hardy as it is attractive, and has a deep, thick root structure. It is more drought tolerant than most varieties of zoysiagrass once established. In addition, slower vertical growth plus natural chinch bug and chemical resistances mean your lawn will require less maintenance, mowing, and water than other types of warm season grass. In some instances, once naturalized to the local climate, EMPIRE Zoysiagrass requires minimal irrigation. Common Bermuda is drought resistant and grows on many soils. It also makes a good turf if fertilized and mowed properly. Common Bermuda is used mostly along highways, roadways and works as a great solution for embankments that need erosion control. Common Bermuda is one of the most economical grasses available in the southern region. If fertilized and maintained properly, it can be a quality turf grass used for golf courses, sports fields, parks, residential and commercial lawns. Tifway 419 Bermudagrass is a hybrid bermudagrass developed specifically for athletic applications such as golf courses, football fields, baseball fields, soccer fields, and other high traffic sporting fields. It is characterized as having a beautiful dark green color with a medium to fine textured leaf. Tifway 419 Bermudagrass is a vigorous grower that establishes itself extremely quickly adding to the benefits of its applications. Your organization will also benefit from its drought and disease resistant qualities that will help add many years to the life of your turf grass with less maintenance requirements. Read below to get a more detailed look at our certified Tifway 419 Bermudagrass. Bahiagrass is a warm season southern grass that is resistant to drought, disease and most insect attacks. Bahiagrass can survive in a variety of soils from sand, sandy to clay and other infertile, dry soils. This grass requires some maintenance to keep looking good in residential and commercial landscapes. Without fertilizer, Bahiagrass will thin out over time. Bahiagrass also has a low tolerance for many weed control herbicides. It is used extensively in lawns along coastal areas in Florida. Bahiagrass has a vigorous growth habit and requires frequent mowing during hot weather. Bahiagrass has a coarse blade and is not suitable for soils with high pH levels. Floratam St. Augustine was released by the Florida and Texas Agricultural Experiment Stations in 1972 as a SAD virus and chinch bug resistant turf selection. It has since been observed to be brown patch as well.